Sandra Laronde hails from the Teme-Augama-Anishinaabe (People of the Deep water) of northern Ontario, Canada. She studied dance at the Banff Centre for the Arts and as well received a Bachelor of Arts (Honors) degree from University of Toronto. 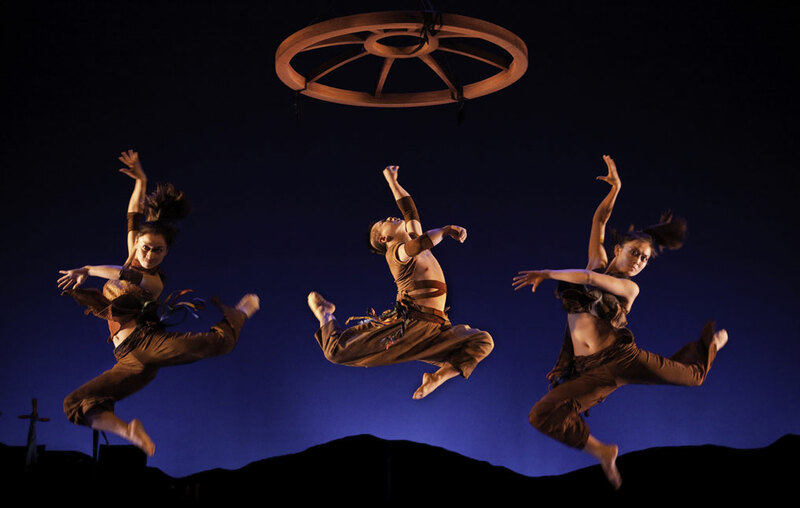 In 2000, Ms. Laronde created Red Sky, the first major contemporary Indigenous dance company in Canada. Since then, Sandra Laronde and Red Sky have garnered numerous awards in Canada: performances such as Dancing Americas, Shimmer, Raven Stole the Sun and, have circled the globe. In her own words she has said that her vision was "to create a leading company that would shape contemporary world Indigenous performance." With her recent visit to Mongolia and China, Sandra Laronde and her creative team have fashioned yet another unique theatrical event. In the creative process, the choreographers Sandra Laronde and Roger Sinha were compelled to discover the common ground of cultures existing oceans apart. As we experience in the performance, two aspects of these Indigenous peoples have existed side by side, backward in time as well as forward into the present: the magnificence of the Horse, and the power of the Shaman. For this world premiere of Tono for the Luminato Festival, Toronto, Red Sky also brought to us the heart of Mongolia: three dancers and three musicians, each an inspiring artist. Tono opens with the entrances of the musicians. Three Mongolian singer/musicians were seated upstage, two Intertribal singers with the Big Drum were placed in the balcony. The composer and collaborator, Rick Sacks, manned an electronic set-up downstage. The sound score soared in range from the lyrical stringed instruments to bass-throated Mongolian singers; amplified bass tones truly "grounded" the work for the entire evening. The opening choreographic moment found one female dancer, sitting, back to us, center stage. In standing and turning, the dancer moves with a life-size horse's skull, establishing the first theme. Images of Horse abound throughout: gallops with speed and precision moved the dancers in herd-like formations, the hands curled inward to form hooves. In companion pieces, a female duet displayed rhythmic synchronized arm sequences inspired by East Asian mudras; the male duet emphasized the strength of stomping, jumping and well-placed vocal calls and shouts. This very human sequence transformed into the image of horse and human rider, complete with reins connecting the two figures. The Red Sky dancers Carlos Rivera (Associate Artist), Raul Talamantes and Julie Choquette were joined by Caihong, Morigen and Wei Jie from Mongolia. The three men and three women were juxtaposed in all episodes, but it must be mentioned that the Mongolian dancers displayed unexpected gymnastic skills. The women in particular, moved through contortion-like postures, contributing to the look of "otherness". One such duet played on strange creatures leaping into the air or diving into a handstand to land in an extreme deep plie (or squat). The full dancing ensemble moved with driving robustness, finesse and with a sense of the unseen mystery throughout. Reference to the Shaman motif did not appear until late in the 55-minute work. The Shaman appears beneath the central overhead set piece, resembling a terra-cotta wheel (set by Julia Tribe). Danced with strength and assurance, the male Shaman emerges from the same center from which the woman emerged in the opening. He seems to establish a contact within himself between the Earth and the Sky; he is given a gift, perhaps an insight, which he then sends out beyond himself. The horse procession appears, within which a chrysalis is seen being dragged on an extended shroud by two figures. The chrysalis is left onstage. It begins to writhe – two figures in the "bundle" struggle to be born. One achieves birth; the other death. Perhaps a new Shaman was born, with equal parts of himself going to the "spirit world"? The procession quietly moves on. The final moments of Tono leave us with a question. In creating Red Sky, Sandra Laronde has joined a growing list of Indigenous companies and choreographers now working in North America. Particularly in Canada, there is a veritable explosion of Indigenous performing art work being created and performed. The year 2000 seemed to be the magic number that signaled the coming-of-age of several decades of creative struggle by Indigenous artists.